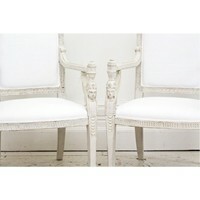 A Pair of 1950's Cowhide Wrought Iron Armchairs. This pair of French armchairs is highly decorative with their ornate black, wrought iron twisted metal frames, ball feet and black and off-white cowhide covering. Incredibly stylish but also extremely comfortable. These could be used inside or out. In excellent condition.